Happy Friday! I hope you had a good July 4th. If you have some vacation coming up and still do not know where to go – never fear! Let me offer you a few options in the Commonwealth of Kentucky. Not Quite the Lincoln Memorial – Along Route 23 in Stanville, Kentucky sits a replica of the Lincoln Memorial. Supposedly the World’s Second Largest Seated Lincoln. It was funded by a lawyer who, in 2017, was sentenced to 12 years in prison for fraud, then fled the country. Guess he was not as honest as Abe. remains. Duncan Hines Museum – There’s an exhibit devoted to the life of Duncan Hines at the Kentucky Museum on the campus of Western Kentucky University. Before “Duncan Hines” was a brand of cake mixes, Duncan Hines was a trusted author of restaurant and lodging recommendations. Mr. Hines was a real person, and passionate about good food and hospitality. He was born in Bowling Green and returned to the city after making a name for himself. I have been there and it is an interesting exhibit. 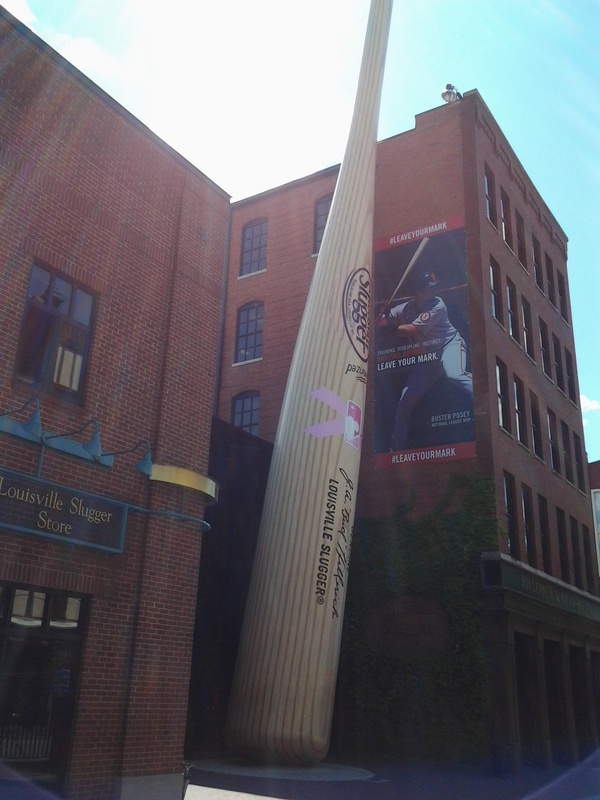 World’s Largest Baseball Bat– It sits outside the Louisville Slugger Museum in Louisville, Kentucky. It is an interesting museum with a factory tour where they show you how the bats used to be made as well as how they are made today. A must see for baseball fans and, of course, I have been there. Take in a Louisville Bats (AAA) game while in town. Birthplace of Kentucky Fried ChickenColonel Harland David Sanders was a real person and you can visit the Café where, in 1940, he perfected that secret combination of herbs and spices. This is another place I have been to, there is a modern KFC attached so you can get your fried chicken fix while you learn about the Colonel. Florence Y’all Water Tower- The Water Tower along I-75 in Northern Kentucky proclaims “Florence Y’all” to motorists passing by. When the Florence Mall developed in the 1960s, the first thing built was the water tower. Seemed like a great idea to promote the soon-to-be mall on the water tower by painting “Florence Mall” on the tower. However, for some reason it was determined this was not a legally permissible. The tower had to be repainted but they wanted to minimize the expense. So, the change was made from “Mall” to read “Y’all.” It has stayed that way since and is now a familiar landmark. I have been by this many, many times over the years. Grave of Man o’ War-How often do you get to visit the grave of a horse? Man o’ War was perhaps the most famous racehorse in history. He was the undisputed king of the turf during the roaring twenties. Man o’ War died in 1947, and a year later a larger-than-life bronze statue of him, sculpted by Herbert Haseltine, was erected over his farmyard grave. His body was embalmed and placed in a giant casket lined with his racing colors. In 1977 the big casket was dug up, and Man o’ War was moved, along with his statue, to Kentucky Horse Park where you can still pay homage to him today. I have been to the Kentucky Horse Park. Moon Bow – Rainbow visible at night-Near Corbin, KY in an area known as Cumberland Gap. The Moon Bow from Cumberland Falls, is only visible on a very clear night during a full moon. The best time for viewing is around midnight. The only other place you can see this is Victoria Falls, Africa. The moon and this waterfall are in alignment so the moon’s light creates the “Moon Bow” in the spray created by the water fall. This is one I would like to see one day. Feudin’ Pig and Stabbing Cabin-The Feudin’ Pig and Stabbing Cabin in McCarr sparked several key flare-ups in the Hatfield-McCoy feud. In 1878 one of the McCoys accused one of the Hatfields of stealing a pig. A trial which saw the Hatfields acquitted was held in the cabin, which belonged to the local judge. The main witness was later killed by the McCoy. In 1882 a fight broke out at the cabin; three of McCoy’s sons killed Hatfield’s drunk brother who was stabbed 27 times. The cabin was rebuilt in 2012 on its original foundation. What adds more to vacation memories that feuds and pigs?. Wagersville, Kentucky – On HWY 89 south of Irvine you can pass by (don’t blink) the remnants of Wagersville and yes, I am one of those Wagers. After you see Wagersville you can take a hike up nearby Happy Top Mountain one of the highest points in Estill County. This entry was posted in Friday Funny, Humor and tagged Kentucky on July 5, 2018 by Leonard. Love these suggestions. Glad to see Wagersville in there. Been to all but a couple.